This is my first blog post for the Pedagoo team, as I mentioned in my #Nurture1314 post I’d really like to get into blogging so I’m starting as I mean to go on. Earlier this year I was lucky enough to attend David Didau’s Whole School Literacy course – having just been appointed Literacy Co-ordinator it was a perfect place to start! Didau’s course gave me so many different ideas that I could try out in my lessons and also feed back to the staff at my school from a literacy perspective. What struck me most was that these ideas weren’t just for literacy, these were fantastic teaching and learning ideas that ALSO supported my students’ literacy. After the course I decided to work on several ideas that I was introduced to during the course, one of those was ‘The Critique Gallery’. I’m sure most will agree that peer assessment is a regular feature in our lessons, it helps develop our students’ confidence in knowing what is right and what is wrong and determining what they need to do to improve; I think subconsciously it helps them to absorb the lesson objectives better too. Didau’s ideas confirmed my growing suspicions that peer assessment in my lessons was becoming a bit dry and unexciting; it’s highly likely that if I’m getting bored of doing something then my students will be too – I’m a technology teacher, I like to mix things up often! The Critique Gallery was a perfect ‘refresh’ to peer assessment and has had an excellent impact on the quality of student to student feedback. The Critique Gallery is like a giant peer assessment. It is a longer exercise than a typical peer to peer assessment, students move around the classroom taking time to read through their peer’s work and provide constructive feedback (I usually devote about 15 minutes of the lesson to do it properly). Clear boundaries and expectations need to be set out by the teacher (more on that shortly…), especially when laying the foundations of this new activity, after all the feedback needs to be constructive so that our students can improve. Students use lesson objectives/success criteria (just like they would a normal peer assessment) to give feedback on other student’s work; they give this feedback a number of different times as they move around the room. What’s so good about Critique Gallery? Firstly it encourages ALL students to engage, they are up and out of their seats moving around the room; sometimes something as simple as moving around/a slight change of scenery can improve a student’s productivity or engagement. Students have the opportunity to see more than just their partner’s work, if like me you have seating plans then your students are sat next to the same faces day in day out…therefore seeing the SAME quality of work day in day out, for some this is great but for others not. 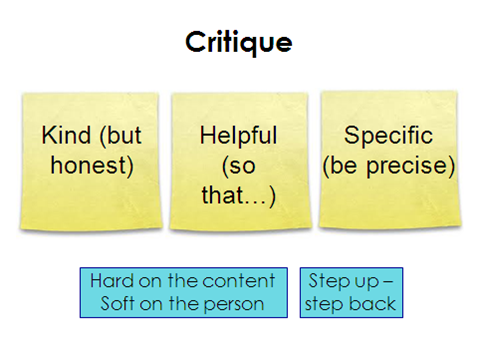 The Critique Gallery allows students to see all levels and abilities and make judgments for themselves about the feedback they want to give. It helps quiet the inevitable “Miss, I don’t know what to write…” especially if done as a mini review during the lesson. This activity also frees you up to wander around the classroom to support students that you know will struggle with this activity, it allows you to carefully question them as to what is good about the work and what needs to be developed further, in turn improving the quality of feedback that they give to other students. I think it’s great when students have a record of the feedback that they have received all in one place instead of scrawled over their work, I’m OCD – I’m sure my students don’t care!! When doing a critique style activity direction needs to be given to students to ensure that the feedback they are giving is productive and useful i.e. NOT “write neater” or “finish it” (don’t get dispirited though, you’ll always end up with one, I know I do!). 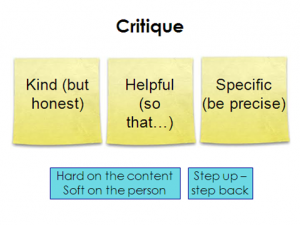 Full credit to David Didau here as I use his pointers for students when doing the critique, I go through these points with my students each time we do a critique activity just to remind them of my expectations and then we’re ready to get started. My final thought on this…I was astounded to hear that 80% of feedback given to students is student to student feedback – as teachers we HAVE to ensure that we model excellent feedback so that our students are doing it right. This entry was posted in Assessment, Creativity, Ideas, Involving Pupils, Literacy, Resource on January 1, 2014 by Francesca Loxley.